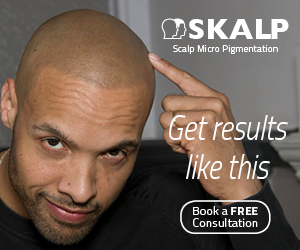 ScalpMP is a boutique scalp micropigmentation provider with a single location in Sacramento, California. A further location in San Francisco is in the pipeline. ScalpMP offer a strictly medical environment and offer a number of specialisms including the repair of poor quality treatments without laser, and some exceptional scar concealment work. There is a growing number of scalp micropigmentation providers in California, however ScalpMP is developing a reputation as one of the best. Here, I explain the history behind the firm and explore some of their recent results. ScalpMP was founded and continues to be managed by Sahand “Sam” Shokati, a micropigmentation technician who studied for a PhD in Biochemistry. He began his training in 2006 to help pay his tuition fees, specialising at the time in medical micropigmentation. Sam became an expert in his field, with a particular talent for concealing scars left as a result of cleft lip repairs, as well as other facial or bodily scarring, and added areola restoration to his expanding repertoire shortly after. People in the industry were performing hair replication, but I was dissasified with the standards I saw. I continued to strive to create a smaller, more natural follicle replication procedure. After years of mastering my process I was finally ready to open my own facility to implement my version of what had been socially branded as Scalp Micropigmentation. I had 100% peace of mind that I had truly mastered my technique, and seen every variable the process and industry can throw at you. The company has a decidedly ‘clinical’ feel in comparison to many other providers. Perhaps it is no surprise that ScalpMP aligns itself with many leading hair restoration surgeons in California, working alongside them to deliver combination transplant and SMP solutions or for scar concealment. I am really impressed with the quality of replication ScalpMP are able to achieve. Each follicle is small, tight and well defined, the hallmarks of a true expert. The extreme attention to detail is obvious. In case you’re wondering about the watermarks by the way, the company was known as Eros Follicle Replication until very recently. Sam wanted to change the name to something simpler and easier to remember, hence ScalpMP. During our discussions, Sam mentioned he’d developed a technique where poor quality scalp micropigmentation procedures could be rectified without the need for laser removal. In hindsight I should have quizzed him on this further, but instead I’ll invite Sam to comment on this post to provide more information. The most rigorous training program in the world? I require that my practitioners train for a minimum of 1 year before I license them to do my procedure. Right now I have 3 apprentices who though hard working, patient and dedicated, have no guarantee that they will finish or receive their licensing. As my apprentices represent my company and my procedure, I’m in no hurry to license anyone I don’t feel 100% comfortable letting do my own head. As an SMP practitioner I am very patient and meticulous, and I expect no less from my apprentices. Hair restoration surgeons are a tough bunch to satisfy. If Sam has managed to build relationships with them to the point where he’s getting referrals and working alongside some of the leading surgeons in California, I can appreciate why he’s so keen to protect his reputation. Its refreshing actually, to know that there are still a few firms in the hair loss industry that value their integrity over short term gain. During my discussions with Sam it was immediately apparent that he has a real passion for helping people, and derives a great deal of satisfaction by doing so. The bond you have with your client lasts for a lifetime. It’s a great feeling to know you have helped change someone’s life. Joining them on the emotional journey and helping them leave their hair transplant scars and daily concealer routines behind is truly amazing. I think of it as one of the best careers. At times I will get calls from clients just telling me what a relief it is to not worry about their transplant scars anymore. How they don’t get people asking them what the scars on their head are. All I know is once I got into this field, I truly found my place in the world. I stopped worrying about becoming a plastic surgeon to help people because this was even better. I am repairing what they’re messing up. I know from personal experience how much satisfaction you can derive from the delivery of an exceptional quality SMP treatment. The result really can change someone’s life, and to know you were ultimately responsible for that change makes it all worthwhile. This year Sam is opening a second facility in San Francisco. He will be taking two practitioners to San Francisco and one will stay in Sacramento. Sam will travel to San Fran and back until his apprentices are ready, so for now he is a one man show in a sense. The existing Scalp MP clinic is based in Rocklin in the Sacramento area, located in a medically zoned facility alongside many medical offices. Sam says he holds his facility at 100% medical standard, using medical grade everything and maintaining a very medical atmosphere. This brings comfort to both his clients and the medical professionals who send him clients. San Francisco will be the same way. The office will be located in a medical building to show the company maintains a higher standard of cleanliness and professionalism than a “tattoo” or “permanent makeup” facility.